As soon as we heard that our students had week-long midterms and we weren’t needed, we hopped on a train to Zhangjiajie. The park itself is actually an hour and a half away from the city proper, so we spent one night in town at the Zhijue Art Hotel and the remaining nights in Yexipu Village at Yangjiajie Mini Inn. Each of our three days was filled with lots of hiking (SO MANY STAIRS! ), golden monkeys, and spectacular views. We started our trip with a relaxing walk along the mostly flat Golden Whip Stream until Zicao Pool. From there, we took a strenuous one hour hike up to the top of Yuanjiajie. The path was almost all entirely uphill stairs, but we took plenty of breaks to admire the many fearless monkeys! At the top, we joined the many tourists who had opted to ride up on the famous Bailong Elevator instead. The top loop was once again flat, and we strolled around admiring the panoramic views. 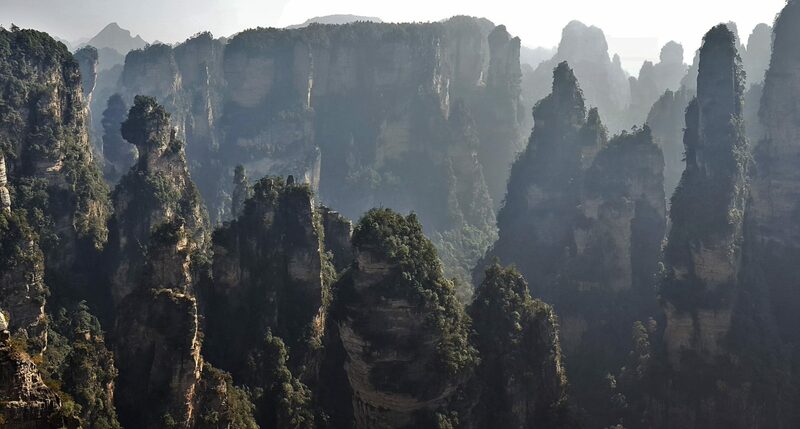 The Yuanjiajie section of the park is home to some of the park’s most famous attractions, including the Avatar Hallelujah Mountain and the Greatest Natural Bridge. From here, we took the free bus over to the Yangjiajie section of the park and hiked to Tianbo Mansion. This was mostly uphill, but had the added excitement of going through thin rock openings and climbing up rickety-looking metal cages! The view at the top was even more spectacular than Yuanjiajie, and we had it almost all to ourselves! After staying as long as we could staring at it in silence, we hiked back and took a relaxing cable car ride down the mountain. Determined to see the rest of the park on what we thought was our last day (we are silly fools who don’t look at plane schedules until the night before), we took the bus up the long, winding road to Tianzi Mountain. On the ride up, we met a Canadian couple who save up 20% of their salary for 5 years and go on a yearlong trip every 6th year. Seriously, #goals! Disappointingly, at the top we found the busiest crowds we had seen the whole time and only a few viewing platforms. We quickly bounced from one to the next, impressed by the scenery but eager to get on to quieter sections. Two Belgian men we met had befriended an English-speaking Chinese girl who was showing them around the park. She was kind enough to convince the Tianzi Tower staff to let us up to the viewing platform without the Chinese tour. Yay for no crowds! We made a quick stop for ice cream at the McDonald’s on top (Tommy’s goal at the park) and walked down the road to Arranging Battle Platform and Shantang Gulf. These were two short, easy hikes that gave just as good of views as Tianzi without any other people. Score! From there, we took the bus back to Yangjiajie and hiked up One Step to Heaven. Another intense uphill climb, this one filled with beautiful woodsy ferns. Just like Tianbo Mansion, the top had a thin metal ladder to climb up, very few people, and breathtaking views. We stood silently in complete and utter admiration of God’s beautiful creation before hiking back down. By this point, we had discovered that the next flight didn’t leave until 10:30 PM, giving us a whole extra day at the park. We headed to the final famous hike we hadn’t completed, Huangshi Village. This area is so played up by the park that they actually have giant billboards saying, “He who fails to climb on Huangshizhai need not have come to Zhangjiajie.” Yikes, pretty big reputation to live up to!! This hike was definitely the hardest. It took us a little under 1.5 hours to drag ourselves up the steep stairs all the way to the top. To be fair, though, we might’ve just been tired from the previous two days of uphill battles. At the top, we meandered along the flat loop trail and stopped at several of the viewing terraces. As with every other point at the park, the views were gorgeous, but we were starting to get mountained out. This section was more heavily forested, and the mountains were thicker and less exciting than their finger-like friends. Huangshi Village, we’re glad we saw you, but you don’t meet the hype. With all the important parts of the park thoroughly explored, we took a bus back into the city. We arrived at the airport ridiculously early, content to just sit and veg while we waited for our flight. Onwards to Beijing! Wow! Thanks for sharing God’s great works. Looks like it was a fun three days. Interesting that there was a McDonald’s there. Love you! Love you too! Can’t wait to hear about Italy. Thanks for taking the huge amount of time to share!! We truly enjoyed the pics you acquired through your hard work! Please continue to stay safe! You ARE having a quarter life adventure all right! Love you two! No problem, I’m glad you guys like them!! Love you too, happy early Thanksgiving! Great photos! This looks like an amazing experience. I can’t believe there is a McDonalds there!